My amazing niece works for an organization supporting and saving women who are victims of domestic violence. Right now is North Texas Giving Day and I knew that I could afford donating $10 so I did. This is much better than splurging on a new shirt or hair gel. 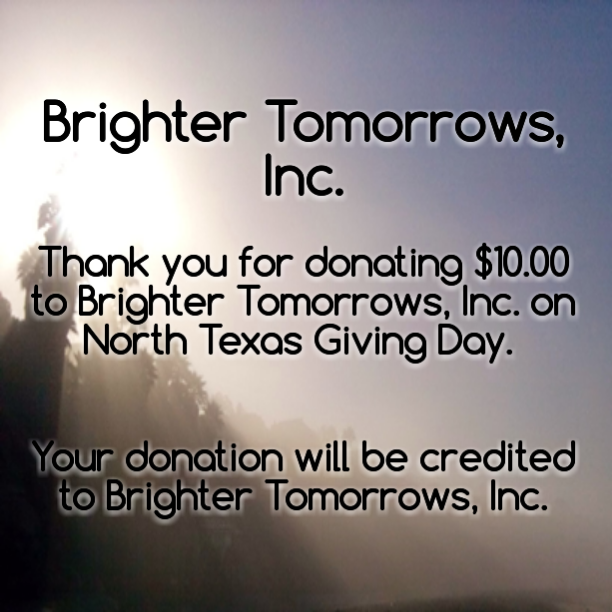 Thank you for donating $10.00 to Brighter Tomorrows, Inc. on North Texas Giving Day. Please print this page for your records. A receipt for tax purposes will also be emailed to the address you provided. Your donation will be credited to Brighter Tomorrows, Inc.